Note: The following information is based on Exchange 2010 SP1 Beta and subject to change in the final product. 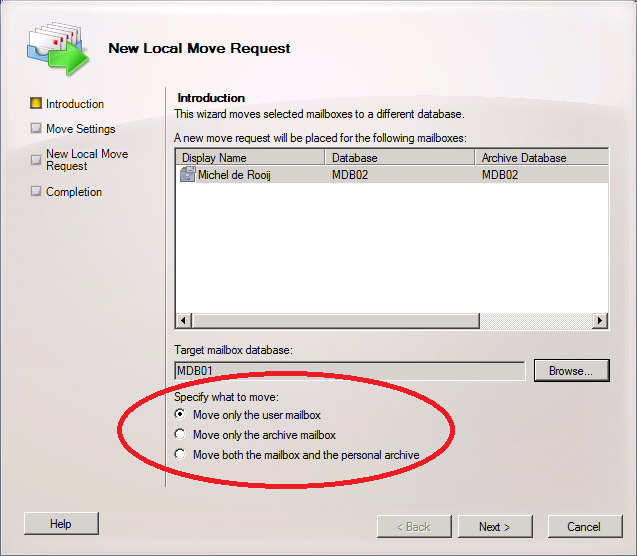 If you transferred mailboxes using PowerShell or performed cross-forest mailbox moves using Exchange 2010 you’re probably familiair with the New-MoveRequest cmdlet. This cmdlet is used to initiate an asynchronous mailbox move talking to the Mailbox Replication Service (MRS) located on one of the Exchange Servers hosting the Client Access Server role. A few changes have been made to the New-MoveRequest cmdlet in Exchange 2010 SP1, which I would like to share with you. The first interesting new option is the Outbound parameter. With Outbound you can specify that the cross-forest mailbox move is to be initiated from the source forest. To initiate the move from the target forest you can use the Remote (identical to RTM). Note that Outbound and Remote are mutually exclusive. RemoteArchiveTargetDatabase can be used to specify the database in the remote forest you want to move the personal archive mailbox to. When omitted, the database hosting the primary mailbox will be used. Note that this cmdlet will not enable archiving for moved mailboxes. For more background on mailbox moves in Exchange 2010 and the role of the Mailbox Replication Service, please consult this TechNet article. This entry was posted in Exchange 2010 and tagged Beta, Exchange2010, SP1 by Michel de Rooij. Bookmark the permalink.